The cytoskeleton of a cell provides structure, strength, and motility. It makes a cellular scaffolding upon which the cellular organization is arranged. It helps to maintain cell shape, moves substances within the cell (cellular trafficking), anchors cellular structures and helps in cell motility in eukaryotic cells. The cytoskeleton is composed of three principal types of protein filaments such as actin filaments, intermediate filaments and microtubules which are held together and linked to sub cellular organelles and the plasma membrane by a variety of accessory proteins. Actin filaments are cross linked by actin-binding proteins to form bundles or three-dimensional networks. Network of actin filaments and cytoskeletal proteins underlies the plasma membrane and cell shap is determined. Actin bundles attach to the plasma membrane and anchor . The actin filaments helps permanent protrusions of the cell surface, like microvilli, as well as transient extensions that are responsible the cell at regions of cell-substratum and cell- cell contact for phagocytosis and cell locomotion. Contraction of muscle results from the sliding of myosin and actin filaments past each other. The cell locomotion generated by different parts of a cell results from the coordination of motion. These motions are very complex and difficult to describe. The major features can be picked up through a powerful fluorescence microscopy. The machinery that powers cell migration is built from the actin cytoskeleton, larger than any organelle. When a fibroblast is observed by fluorescence microscopy after the actin filaments are stained, radially oriented actin filament bundles is seen at the leading edge, and axial bundles is known as stress fibers, and are visible underlying the cell body . The rest of the cell is filled by a network of actin filament, but in the individual filaments of these networks are difficult to observe in the light microscope. There are several fluorescent and biotinylated Phalloidin and Phallacidin derivatives for labeling F-actin. 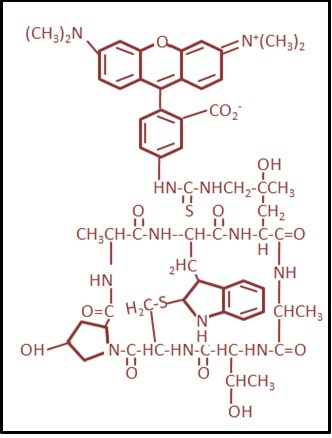 These phallotoxins, isolated from the deadly Amanita phalloides mushroom, bicyclic peptides which are differ by two amino acid residues. This can be use interchangebly in most applications and bind competitively to the same sites in the F-actin. Phallacidin and phalloidin contain an unusual thioether bridge between a tryptophan and cysteine residue, which forms an inner ring structure. The elevated pH, this thioether is cleaved and the toxin loses its affinity towards actin. The phallotoxin conjugates are very small, with an approximate diameter (12–15 Å) and molecular weight of less than 2000 daltons, a variety of actin-binding proteins including tropomyosin, myosin, DNase-1 and troponin can still bind to actin after treatment with phallotoxins. More significantly, phallotoxin labeled actin filaments remain functional; the labeled glycerinated muscle fibers contract and labeled the actin filaments move to the solid-phase myosin substrates.To quantitate the amount of F-actin in cells by using fluorescent phallotoxins. The unlabeled phallotoxins may be used as the controls in blocking F-actin staining or to promoting the actin polymerization. Biotinylated phallotoxins and fluorescent stain F-actin at nanomolar concentrations and water soluble, thus providing convenient probes for identifying, labeling and quantitating F-actin in tissue sections, cell cultures or cell-free experiments. The labeled phallotoxins are same affinity in the case of both small and large filaments, which is binding in a stoichiometric ratio of about one phallotoxin molecule per actin subunit in muscle and nonmuscle cells from the different species of animals and plants. Unlike antibodies, the binding affinity to the actin does not change appreciably from different species or sources. The nonspecific staining was negligible, and the contrast between unstained and stained areas is very large. Phallotoxins are not able to bind to monomeric G-actin. Phallotoxins stabilize F-actin,that inhibited the depolymerization by cytochalasins, potassium iodide, and increased temperatures. Rhodamine phalloidin is the most widely used F-actin stain. It is made from a mushroom toxin conjugated to the orange-fluorescent dye, tetramethylrhodamine (TRITC). The red fluorescent probe binds to F-actin with nanomolar affinity and very photostable. The fluorescent phallotoxins are applied to fixed and permeabilized cells but can be loaded into live cells via cationic liposomes.